Patients with chronic organ failure receive organs from living donors or brain-dead donors. In our country, brain death and organ transplantation procedures are carried out with Turkish Laws #2238 on the Harvesting, Storage, Grafting, and Transplantation of Organs and Tissues (June 3, 1979). Improvements in legislation have been made on the criteria of diagnosis of brain death and how diagnosis will be made. The recommendation for termination of life support of non-donor brain-dead patients was removed. Due to this uncertainty, hesitancy arises in terms of the discontinuation of life support among healthcare workers. In our study, we aimed to draw attention to the issue about the fate of non-donor brain-dead patients. 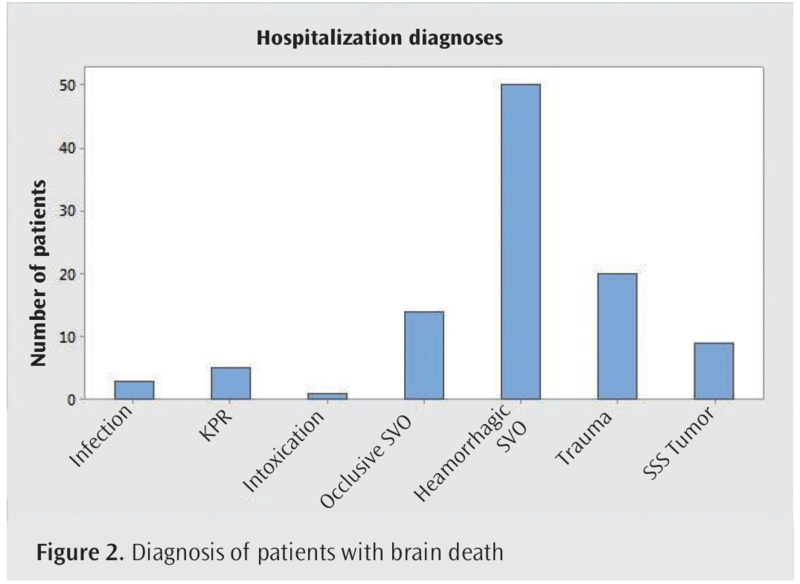 In our study, we retrospectively evaluated data of brain-dead patients between January 1, 2011 and June 1, 2017 in our hospital. Of the 122 patients with brain death, 102 were not donors. The mean lifetime of non-donor patients was 29±56 hours. It was observed that cardiac death occurred in the longest surviving patient after 116 hours following declaration. Thirty-five patients were given new vasopressor or inotropic drugs after brain death. The brain-dead person is considered medically and legally dead despite heartbeats. It is not reasonable to maintain the life support of the individual who is considered dead. Considering the insufficient number of intensive care units and the high cost of medical support, it is of great importance to establish legal arrangements that will allow the discontinuation of medical support that is useless in non-donor brain-dead patients and enable the use of life-supporting devices for the patients in the waiting list. Organ transplantation is a surgical operation in which an irreversibly damaged organ is removed and replaced with a functioning organ harvested from a donor. Organs are received from living donors or brain-dead donors. Brain death was first described in 1959 by Mollaret and Goulon as “coma dépassé”. The milestone for the definition of brain death was the publication of the Harvard criteria. Following this definition, brain death and organ transplantation issues have united and progressed on common ground (1). In our country, brain death and organ transplantation procedures are carried out with Turkish Laws #2238 on the Harvesting, Storage, Grafting, and Transplantation of Organs and Tissues (June 3, 1979). Improvements in legislation have been made over time on the criteria of diagnosis of brain death and how diagnosis will be made, however, there is no clarity about non-donor cases. Although brain-dead patients are considered legally dead (2), health workers may hesitate to terminate life support due to uncertainty in legislation. In this study, a retrospective analysis of brain-dead patients in a training and research hospital between 2011 and 2017 was conducted, and it was aimed to draw attention to unclear points in the management of non-donor cases in the light of the data obtained. Brain-dead patients between January 1, 2011 and June 1, 2017 were reviewed retrospectively after receiving approval from the İstanbul Training and Research Hospital Ethics Committee of our hospital (decision no: 23/06/2017-1018). According to the decision taken by the organ transplantation commission of our hospital, single-photon emission computed tomography is performed as a supportive test for the patients who are thought to be clinically brain-dead after the apnea test and then declaration is done. Demographic data, reasons for admission, “acute physiology and chronic health evaluation (APACHE 2)” scores, time to diagnosis, additional test rates, transplantation rates, time to transplantation, time to cardiac death of non-donor patients, and procedures performed during this period were recorded. Statistical analysis was performed using Minitab 17 (Minitab Statistical Software, Pennsylvania, USA). Descriptive statistics were expressed as mean, minimum-maximum, standard deviation, numbers and percentage. Data with non-normal distribution were compared using Mann-Whitney U test and chi-square test was used to compare categorical variables. In our study, 122 patients were examined. The mean time from the intensive care unit admission to the suspicion of brain death was found to be 3.79±3.1 days. 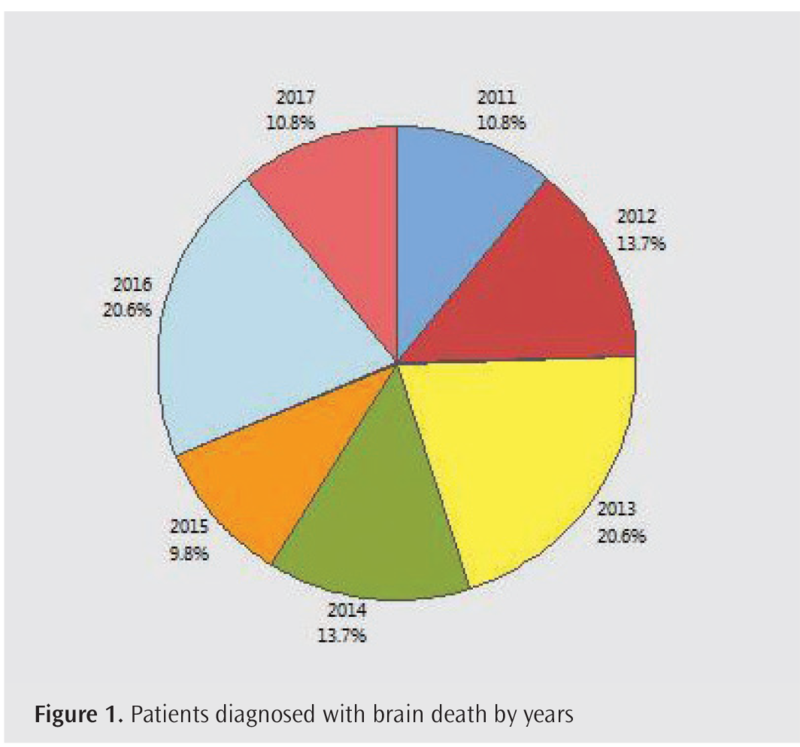 The distribution of the patients diagnosed with brain death according to years and diagnosis are shown in Figure 1 and Figure 2, respectively. It has been observed that the hemorrhagic cerebrovascular events take the first place among the causes of brain death. This is followed by ischemic cerebrovascular events, trauma, malignancy, successful resuscitation after cardiac arrest, infections and intoxications. Although four out of 122 patients were diagnosed with brain death after apnea test, declaration could not be made because no supportive test could be performed. Brain death declaration was made in 118 patients and 20 of these 118 patients became donors. Apnea test could not be performed due to hypoxia or hemodynamic instability in three donors and five non-donors. Demographic data of donors and non-donors are shown in Table 1. There was no significant difference between two groups in terms of age, APACHE 2 scores and time to declaration (p>0.05). Two of 15 patients who were non-citizens of the Republic of Turkey became donors. The mean organ harvesting duration was 18.15±15 hours. The mean cardiac death of the non-donor patients was 29±56 hours, and the longest period between brain death and cardiac death was 116 hours (Table 2). Thirty-five non-donor patients were given new vasopressor or inotropic drugs after brain death notification. Twelve of these patients had cardiopulmonary resuscitation (CPR) after cardiac arrest. Organ transplantation has been used as a salvage treatment in patients with end-stage organ failure. The organs required for these patients are harvested from living or brain-dead donors. While death is a medical condition, it has psychological, economic, legal, ethical, religious and social consequences. Somatic death, which means cessation of heartbeats and breathing, is accepted and understood as death (3). Brain death is now accepted as the irreversible loss of brain and brain stem reflexes. For this reason, brain death is not sufficiently recognized and causes anxiety among relatives of patients and health workers. Furthermore, coma, persistent vegetative status and brain death cannot be clearly differentiated by society. Therefore, the improvements seen after these clinical conditions, although very rarely, are misunderstood by the society and cause them to move away from the idea of ​​organ transplantation and discontinuation of life support after brain death (4,5). Another reason for rejecting discontinuation of life support is religious concerns. According to İslam, life is sacred and protected. However, according to the results of fiqh studies, it is accepted that brain death is also true death. In the published fatwa, it is stated that brain-dead people should be accepted as dead (6). With the entry into force of the Law No. 2238 on 29 May 1979, it is decided that the organs can be taken from brain-dead people. Although there is no definition of brain death in the law, this situation did not create problems in practice. On 16 August 1990, the brain death criteria approved by the General Directorate of Therapy Services of the Ministry of Health have been notified. Brain death criteria were published in the Official Gazette on August 20, 1993, and the concept of brain death was given a legal dimension. Although there was a statement indicating that “If the organ donation permit cannot be obtained after the brain death is declared to the relative of the patient, the medical support applied to the patient will be discontinued” in the 1993 criteria, this approach was amended in the Regulation on Organ and Tissue Transplantation dated June 1, 2000, and was rephrased as “the medical support can be discontinued if the relatives of the patient permit”. In the Regulation on Organ and Tissue Transplantation, dated February 1, 2012, the rules for the diagnosis of brain death have been re-published, but there was no statement on the decision to discontinue medical support in non-donor cases made by relatives of the patient and/or by the health team (1). This has led to hesitations in discontinuing medical support by making the issue of authority questionable. For Turkish law, as in Universal Medicine Law, death also occurs when a person’s brain and brainstem functions are lost to an irreversible degree. The brain-dead person is considered medically and legally dead despite heartbeats. It is not reasonable to maintain the life support of a dead individual. Although this condition is not included in the new regulation, it should be noted that there is no need to wait for approval or request of the relatives of the patient for discontinuation of life support if there is no consent for organ transplantation in a person whose brain death has been realized and duly certified. In addition, in the presence of another patient in need of a life support device such as a mechanical ventilator, resources should be allocated to patients in need due to the fair use principle; otherwise, continuation of medical support with such a device could lead to the responsibility of the physician (7). In our retrospective evaluation, it was seen that four patients were expected to undergo an additional test after apnea test; however, cardiac death was observed in these patients. Due to this delay, declaration could not be made to the family and potential organ donors were lost. In our evaluation, organ transplantation was not accepted by the relatives of 98 cases. In non-donors, the period between brain death and cardiac death was determined to be at least 1 hour, maximum 116 hours and mean 29.56 hours. Although the financial burden of 98 brain-dead patients with a mean of 29.56 hours of care could not be calculated, it can be regarded as futile. Karasu et al. (8) reported that 43 non-donor patients had lived for a mean of 2.5 days and continued life support in case their relatives change their minds. In addition, they stated that they had continued life support since relatives of patients did not allow life support to be discontinued before 2012. In our study, we identified 11 cases before 2012 and we found that five of them were started vasopressors. In our study, we determined that 35 non-donor patients were started vasopressor agent after the family interview. Although the reason for the failure to discontinue life support could not be reached from our records, we have seen that one patient in 2011 and 11 patients in 2012 underwent CPR. A study showed that physicians and nurses who believe that life support should be maintained in these cases is 13.4% and 20.1%, respectively. In the same study, it was revealed that 11.2% of physicians did not believe that the brain-dead cases had died legally (9). The main reason for the continuation of life support by health care workers may be that medical law is not included in medical education and health workers cannot get enough support from the institutions. When this is the case, it will be reasonable to apply to the organ transplant management of the hospital. Health workers should be encouraged to participate in the trainings provided by the Ministry of Health and the lack of information should be avoided. It should also be kept in mind that healthcare professionals are individuals and may have concerns about discontinuing life support due to their religious, conscientious, and social presence as well as their professional personality. Therefore, all health care workers responsible for patient care should also be supported in this direction. Relatives of patients who cannot comprehend the definition of brain death hope that their patients can return to life and therefore they are reluctant to decide to discontinue medical support. Intimate early communication with the relatives of the patients can overcome this, however, relatives of patients who are difficult to communicate and who are in a state of denial in addition to the unwillingness of health workers to discontinue life support lead to occupation of beds by non-donor cases. This situation prevents the intensive care conditions from being used by intensive care patients. The lack of confidence in the existing legislation and the decision to interrupt the medical support in non-donor cases and the decision on who to make this decision is not being explicitly stated increases the doubts about this issue (10). Considering the necessity of rational use of intensive care beds in our country and the high cost of medical support, we think that the legal arrangements that will allow us to discontinue medical support that is useless in non-donor cases and to direct the life supporting devices to the waiting patients should be implemented rapidly. Ethics Committee Approval: The study was approved by the Ethics Committee of İstanbul Training and Research Hospital with the decision number 23/06/2017-1018. Author Contributions: Concept - İ.C. ; Design - İ.C., S.S.; Supervision - V.E. ; Data Collection and/or Processing - S.S., S.B. ; Analysis and/or Interpretation - İ.C. ; Literature Search A.T.; Writing Manuscript - İ.C., S.S.; Critical Review - V.E. Çil O, Görkey Ş. Beyin ölümü kriterlerinin tarihsel gelişimi ve kadavradan organ nakline etkisi. Marmara Tıp Dergisi 2014; 7: 69-74. Hakeri H. Organ ve doku nakli ve hukuki sorunlar. Tıp, etik, din, sosyoloji ve hukuk bağlamında organ nakli, sorunlar ve çözüm önerileri sempozyumu; 2014 Mayıs 9; Malatya, Türkiye. Süren Ö. Organ ve doku naklinin etik açıdan incelenmesi. TBB Dergisi 2007; 73: 174-95. Can F. Organ bağışında aile onayı üzerine bir gözden geçirme. Nesne Psikoloji Dergisi 2017; 5: 131-49. Kıraklı C, Uçar ZZ, Anıl AB, Özbek İ. Yoğun bakımda beyin ölümü kesin tanı süresinin kısalmasının organ bağışı oranlarına etkisi. Yoğun Bakım Dergisi 2011; 1: 8-11. Görgülü Ü. İslam hukuku açısından yaşam desteğinin sonlandırılması. tıp, etik, din, sosyoloji ve hukuk bağlamında organ nakli, sorunlar ve çözüm önerileri sempozyumu; 2014 Mayıs 9; Malatya, Türkiye. Hakeri H. Tıp Hukuku. 10. Baskı. Ankara: Seçkin Yayıncılık; 2015. Karasu D, Yılmaz C, Karaduman I, Çınar YS, Büyükkoyuncu N. Beyin ölümü olgularının retrospektif analizi. Yoğun Bakım Dergisi 2015; 6: 23-6. Tepehan S, Elmas İ. Beyin ölümü tanısı almış hastalarda tıbbi desteği kesme kararı ve bu konudaki yetki sorunu. Bakırköy Tıp Dergisi 2016; 12: 207-12. Tepehan S, Elmas İ. Türkiye’de beyin ölümü tanısına güven sorunu ve organ bağışına yansımları. Yoğun Bakım Hemşireliği Dergisi 2014; 18: 8-14.